To Cite: Hosseini P, Mundis G, Yoo K. Successful Spine-Shortening Osteotomy for Recurrent Tethered Cord Syndrome in a Patient with Ehlers-Danlos Type III and Mosaic Trisomy 20: A Case Report, Shafa Ortho J. 2018 ; 5(1):e64977. doi: 10.5812/soj.64977. The authors report a rare case of recurrent tethered cord syndrome in the context of Ehlers Danlos Syndrome and mosaic trisomy chromosome 20 that was successfully treated by shortening vertebral column with a partial corpectomy. The patient was a 20-year-old female diagnosed with Ehlers Danlos type 3 and mosaic trisomy 20.Her lower extremities sensation and strength gradually deteriorated, and a clinical and radiographic diagnosis of tethered cord syndrome was made. She underwent three detethering surgeries, which all were complicated with retethering and arachnoid cyst formation. The massive amount of scar formation found on the third attempt at detethering surgery forced the surgeon to leave the spinal cord tethered and plan for spinal-shortening osteotomy. A T11 vertebral column resection shortened the spine by 20 mm and allowed gradual and significant recovery of lower limb neurological deficits. Authors reported this rare case in order to (a) propose the consideration of the spine-shortening osteotomy as the primary surgery in a tethered cord syndrome patient with a higher possibility of scar formation like Ehlers Danlos Syndrome (b) and to report a rare case of tethered cord syndrome in the context of Ehlers Danlos Syndrome with mosaic trisomy 20 and (c) raise the awareness of the possibility of unreported genetic association of Ehlers Danlos Syndrome with mosaic trisomy 20. Tethered cord syndrome (TCS) is a clinical condition with multiple etiologies. It is characterized by traction on nerve roots and the spinal cord, which can cause pain and neurological symptoms. TCS may also cause limb and spinal deformities (1, 2). Surgical management of TCS is highly recommended especially in young and symptomatic patients. Traditionally, detethering is attempted first and spine-shortening osteotomy is reserved for recurrent TCS scenarios (3). Ehlers Danlos syndrome (EDS), is an autosomal dominant connective-tissue disorder which is classified into several primary types (3). To our best knowledge reports of TCS in the context of EDS are very scarce. In this paper, we present a successful spine-shortening osteotomy treatment of a rare case of recurrent TCS in the context of EDS type 3 associated with mosaic trisomy 20. 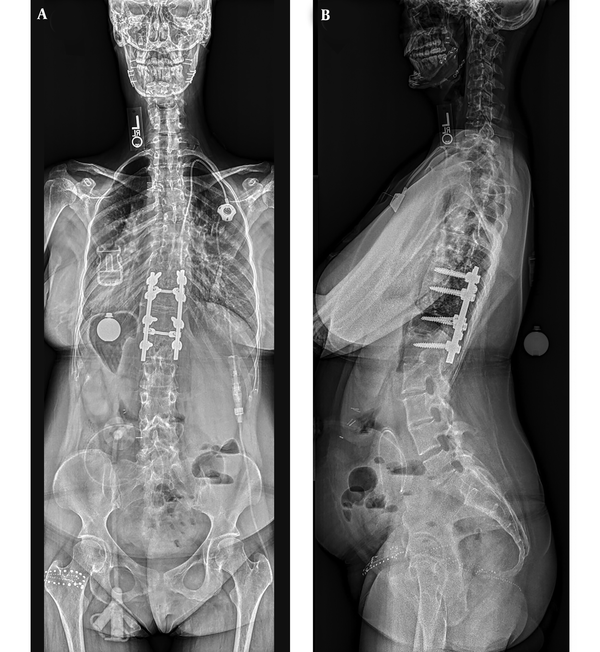 A 20-year-old female with kyphoscoliosis was diagnosed with TCS. Detethering surgery was performed in 2014 with uneventful postsurgical recovery. About one year later the neurological signs and symptoms including decreased general lower extremities’ strength and sensation recurred. MRI confirmed the TCS recurrence and arachnoid cyst formation (Figure 1). Laminectomy resection of intradural lumbar arachnoid cyst and detethering of tethered cord was performed under neurophysiologic monitoring. However, postoperatively the operation became complicated with cerebrospinal fluid (CSF) leak that caused great difficulty with headaches and getting out of bed and required multiple blood patches. Initially patient had return of her strength and sensation. However, over two months, lower extremity strength gradually deteriorated again and sensation severely decreased. Recurrent arachnoid cyst and tethered cord syndrome was diagnosed based on repeat MRI. Urgent arachnoid cyst resection and untethering was attempted. The arachnoid cyst was surgically decompressed. However, the attending surgeon was not able to untether the cord the third time due to extremely heavy scar formation at the site of tethering and a spine-shortening osteotomy was planned to deal with recurrent TCS at a later date. One week later patient underwent a partial vertebral column resection (VCR) of 20 mm at T11 performed by lateral extracavitary approach and partial corpectomy of T11 associated with posterior segmental instrumentation from T9-L1. Figure 1. A and B, L3 Laminectomy with Persistent Tethered Appearance of the Conus Medullaris at L2-3 Region, Where She Had Previous Surgery. Patient had immediate return of some lower extremity neurologic function and continued to see gradual improvement over the following year post-operatively. She improved from being 1/5 strength pre-operatively and now is able to ambulate independently. She is still experiencing lack of proprioception, pain and temperature, and light touch in bilateral lower extremities. Her lower limb motor functions are 4/5 bilaterally in iliopsoas, quadriceps, tibialis anterior, extensor hallucis longus, and gastroc-soleus muscle groups. Post-operative radiographs of the patient with good alignment and fusion have been demonstrated in Figure 2. Figure 2. A and B, AP and Lateral Radiograph of Patient One Year Post Op with Good Alignment and Fusion with No Radiographic or Complication. Among different presentations of EDS, increased tendency for scar formation has been reported, which is secondary to abnormal collagen formation (4). It has also been reported that wounds of patient with EDS are hard to heal (5). However, when they heal, they form scars that widen with time and resemble “cigarette paper” (6) .These “cigarette paper” scars even can occur at the site of very minor surgical procedures (7). The association between TCS and EDS has been previously discussed (8). To our best knowledge, there is no published report of TCS in the context of Ehlers Danlos syndrome (EDS). However, only one meeting abstract exists regarding the concurrence of TCS with vascular form of EDS in two patients (9). Here, we presented a rare TCS case in the context of EDS, which might further potentiate a relation between these entities. Moreover, the EDS of our case was accompanied with mosaic trisomy 20, a finding that has not been noticed in the earlier investigations. Surgical management of recurrent TCS is also a challenging subject. Detethering is a well-established surgical treatment for TCS (10). However, detethering often causes retethering and recurrence of symptoms due to scar formation. Retethering has been reported in 5% to 50% of patients (11). Surgery for recurrent TCS often gets complicated due to neurological and surgical site complications (12). In addition, multiple repeated surgeries increase the risks of iatrogenic injuries, which consequently diminish benefits of the surgical treatment (13). Considering the shortfalls of these traditional detethering surgeries, Kokubun et al. (14) introduced a spine-shortening procedure that relieved tension on the neural elements without violating the dura. Spine-shortening osteotomies at thoracolumbar regionis theorized to indirectly relieving tension on the tethered neural elements at lower levels (15). Accordingly, the patient in the current report was treated with spine-shortening osteotomy of 20 mm after multiple failed detethering attempts. In order to prevent kinking of the spinal cord and consequent neurological deterioration, osteotomies in excess of two-thirds of vertebral segments are not recommended (16) and a 20 mm shortening is considered safe and efficient for tension reduction (17). However, the exact amount of shortening osteotomy to achieve the best neurological outcomes is still unknown (18). Hsieh et al. (12) recommended shortening osteotomies in primary and recurrent TCS cases without local mass effects or symptoms that can be tackled with detethering surgeries. In a cadaveric study, Grande et al. (19) recommended spine-shortening osteotomies as an alternative to detethering surgeries when the risk of complications are high due to the presence of massive scar at tethered cord region. In their study, a 20 - 25 mm osteotomy at T11-T12 reduced tension in the lumbar and sacral nerve roots and the terminal filum from 4.6 g to less than 0.6 g. This amount of achieved tension reduction by osteotomy was equivalent to a simulated traditional detethering operation. By highlighting the recurrence of neurological symptoms in half of Kokuban’s cases, Traynelis debated that spine-shortening osteotomy should be reserved for recurrent TCS cases until its role as a primary procedure for TCS is further defined. However, Kokubun proposed that delaying osteotomy treatment by trial and error detethering surgery will impose more scar formation and less oxygen supply to the spine, which might be responsible for less favorable long-term neurological recovery after osteotomy as a secondary option. Traynelis did agree that there are some certain cases of TCS that might benefit from primary osteotomy (17, 18). Considering the current and previous case reports and cadaveric studies, the authors would like to propose at least the consideration of primary spine-shortening osteotomy in a TCS patient with disorders that increase the risk of scar formation like EDS. In addition we felt that it was important to report the recurrence of tethering in the context of EDS in order to raise the awareness of the possibility of increased risk of retethering specifically when the patient suffers from a connective tissue disorder like EDS. On the other hand, authors admit that the spine-shortening osteotomy is a major surgery with considerable complications (20). Hence, advantages and disadvantages of offering spine-shortening osteotomy as a primary operation should be carefully examined and discussed in details with the patient. Based on the findings of the current case, authors theorized that there might be a genetic correlation between mosaic trisomy 20 and EDS. Authors admit that this is just a single case report and the occurrence of trisomy 20 and EDS might have happened just as a coincidence. Future reports of similar findings if observed would be valuable and help in better understanding the rate of retethering in EDS, the best initial surgical option in EDS with TCS, and the possibility of further genetic correlations between EDS and unreported genes. 1. Agarwalla PK, Dunn IF, Scott RM, Smith ER. Tethered cord syndrome. Neurosurg Clin N Am. 2007;18(3):531-47. doi: 10.1016/j.nec.2007.04.001. [PubMed: 17678753]. 2. Barutcuoglu M, Selcuki M, Umur AS, Mete M, Gurgen SG, Selcuki D. Scoliosis may be the first symptom of the tethered spinal cord. Indian J Orthop. 2016;50(1):80-6. doi: 10.4103/0019-5413.173506. [PubMed: 26955181]. 3. Leganger J, Soborg ML, Farholt S, Lund AM, Rosenberg J, Burcharth J. [Ehlers-Danlos syndrome]. Ugeskr Laeger. 2016;178(17). [PubMed: 27136954]. 4. Shirley ED, Demaio M, Bodurtha J. Ehlers-danlos syndrome in orthopaedics: etiology, diagnosis, and treatment implications. Sports Health. 2012;4(5):394-403. doi: 10.1177/1941738112452385. [PubMed: 23016112]. 5. Ryan N, Walkden G, Akbar S. Some wounds are hard to heal: an interesting presentation of Ehlers-Danlos syndrome. J Wound Care. 2012;21(5). 6. Halim AS, Emami A, Salahshourifar I, Kannan TP. Keloid scarring: understanding the genetic basis, advances, and prospects. Arch Plast Surg. 2012;39(3):184-9. doi: 10.5999/aps.2012.39.3.184. [PubMed: 22783524]. 7. Stanford DG, Georgouras KE. Ehlers-Danlos syndrome type II: importance of recognition. Australas J Dermatol. 1995;36(3):153-5. [PubMed: 7487742]. 8. Henderson FC, Austin C, Benzel E, Bolognese P, Ellenbogen R, Francomano CA, et al. Neurological and spinal manifestations of the Ehlers–Danlos syndromes. Wiley Online Library; 2017. 9. Bangura S, Griswold BF, Sloper L, McDonnell NB. 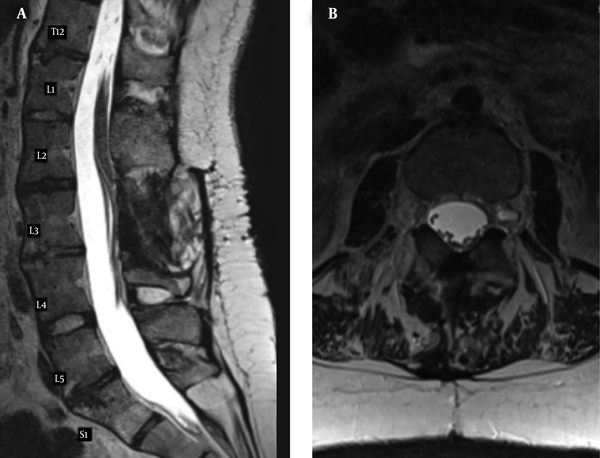 Tethered Spinal Cord in Patients with Vascular Ehlers-Danlos Syndrome. The American Society of Human Genetics; 2008. 10. Lee GY, Paradiso G, Tator CH, Gentili F, Massicotte EM, Fehlings MG. Surgical management of tethered cord syndrome in adults: indications, techniques, and long-term outcomes in 60 patients. J Neurosurg Spine. 2006;4(2):123-31. doi: 10.3171/spi.2006.4.2.123. [PubMed: 16506479]. 11. Hsieh PC, Stapleton CJ, Moldavskiy P, Koski TR, Ondra SL, Gokaslan ZL. Posterior vertebral column subtraction osteotomy for the treatment of tethered cord syndrome: review of the literature and clinical outcomes of all cases reported to date. Neurosurg Focus. 2010;29(1). E6. 12. Hsieh PC, Stapleton CJ, Moldavskiy P, Koski TR, Ondra SL, Gokaslan ZL, et al. Posterior vertebral column subtraction osteotomy for the treatment of tethered cord syndrome: review of the literature and clinical outcomes of all cases reported to date. Neurosurg Focus. 2010;29(1). E6. doi: 10.3171/2010.4.FOCUS1070. [PubMed: 20594004]. 13. Al-Holou WN, Muraszko KM, Garton HJ, Buchman SR, Maher CO. The outcome of tethered cord release in secondary and multiple repeat tethered cord syndrome. J Neurosurg Pediatr. 2009;4(1):28-36. doi: 10.3171/2009.2.PEDS08339. [PubMed: 19569907]. 14. Kokubun S. Shortening spinal osteotomy for tethered cord syndrome in adults. Spine Spinal Cord. 1995;8(Suppl 12):5. 15. Kanno H, Aizawa T, Ozawa H, Hoshikawa T, Itoi E, Kokubun S. Spine-shortening vertebral osteotomy in a patient with tethered cord syndrome and a vertebral fracture. Case report. J Neurosurg Spine. 2008;9(1):62-6. doi: 10.3171/SPI/2008/9/7/062. [PubMed: 18590413]. 16. Kawahara N, Tomita K, Kobayashi T, Abdel-Wanis ME, Murakami H, Akamaru T. Influence of acute shortening on the spinal cord: an experimental study. Spine (Phila Pa 1976). 2005;30(6):613-20. [PubMed: 15770174]. 17. Kokubun S, Ozawa H, Aizawa T, Ly NM, Tanaka Y. Spine-shortening osteotomy for patients with tethered cord syndrome caused by lipomyelomeningocele. J Neurosurg Spine. 2011;15(1):21-7. doi: 10.3171/2011.2.SPINE10114. [PubMed: 21495816]. 18. Traynelis VC. Spine shortening of tethered cord. J Neurosurg Spine. 2011;15(1):19-20. author reply p 20. doi: 10.3171/2010.12.SPINE10725. [PubMed: 21495811]. 19. Grande AW, Maher PC, Morgan CJ, Choutka O, Ling BC, Raderstorf TC, et al. Vertebral column subtraction osteotomy for recurrent tethered cord syndrome in adults: a cadaveric study. J Neurosurg Spine. 2006;4(6):478-84. doi: 10.3171/spi.2006.4.6.478. [PubMed: 16776359]. 20. Ikenaga M, Shikata J, Takemoto M, Tanaka C. Clinical outcomes and complications after pedicle subtraction osteotomy for correction of thoracolumbar kyphosis. J Neurosurg Spine. 2007;6(4):330-6. doi: 10.3171/spi.2007.6.4.8. [PubMed: 17436922].